Secondary Armament 1 x 7.92mm Besa Machine Gun (Coaxial). Main Armament: 1 x 15mm Besa Mk.I MG (100 x Rounds). Secondary Armament: 1 x 7.92mm Besa MG (2000 x Rounds). Notes: Modifications to the turret, and improved armour around hull front. Notes: New three man turret with added radio operator. Main Armament: 1 x 37mm L/57 M6 Gun (51 x Rounds). 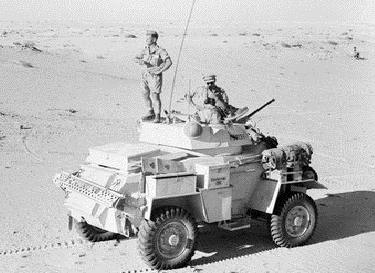 Notes Based on the chassis of the Guy Armoured Car, the Humber were first issued in 1941. Early marks had a 15mm Besa machine along with a coaxial mounted 7.92mm Besa. The final variant mounted a US built 37mm gun which gave it more punch. Crew members varied with different marks and early marks had three crew with four being carried in the mark III. This dropped down to three again when the larger 37mm gun was installed. The Humber first saw action in the western desert with the 11th Hussars and went on to serve in Italy, northern Europe and the Far East.